An agenda is essential to all meetings, be it professional or not. The requirement to schedule a meeting always makes it necessary for companies to have an agenda. When you find yourself attending meetings and gatherings, you get to observe the flow of the meeting through the agenda. An agenda is not at all times written formally. Inviting a group of people without providing an agenda will not serve any purpose. One must know that if they opt for a professional agenda, it goes with a lot of specifics and professional procedures. Companies that decide to invest a little time to create a professional agenda for the meeting in most cases end up on the successful side because they manage to create interest among the invitees making them feel compelled to attend. Companies may have set dates for a meeting every month or even decide to schedule one unexpectedly. Regardless of how much or how little time the company has before the scheduled meeting it is extremely important for them to have a professional agenda created. If problems still occur during the meeting, a well-designed agenda increases the team’s ability to effectively and quickly address them. Companies functioning in different industries may have some subjects to discuss when they schedule a meeting which requires the attendance of other members. 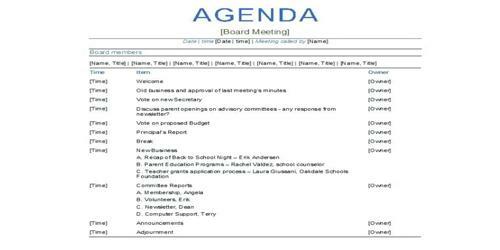 The agenda will provide information on why the meeting has been scheduled by ensuring that the attendees have information about the discussion which they have been invited to participate in. Leave a professional impression on your external partners and customers. An effective agenda sets clear expectations for what needs to occur before and during a meeting. It is also a method to keep other members of the company informed about the subjects which will be discussed. Most importantly a professional agenda will ensure the timely commencement and conclusion of the meeting. When it is time to plan a meeting, whether for business or otherwise, you should not have to waste time creating an agenda from scratch. A professional agenda for a meeting must be written by an experienced employee of the company who may have written the agenda earlier. They must consider the information they need to provide to the attendees while ensuring that the meeting does not extend beyond the scheduled hours. They certainly have the liberty to exercise a degree of flexibility because unexpected discussions or objections are often known to scramble schedules without warning. The writer, however, needs to include the most common points of the meeting on the agenda before sending it out. General banking system of Sonali Bank Limited.